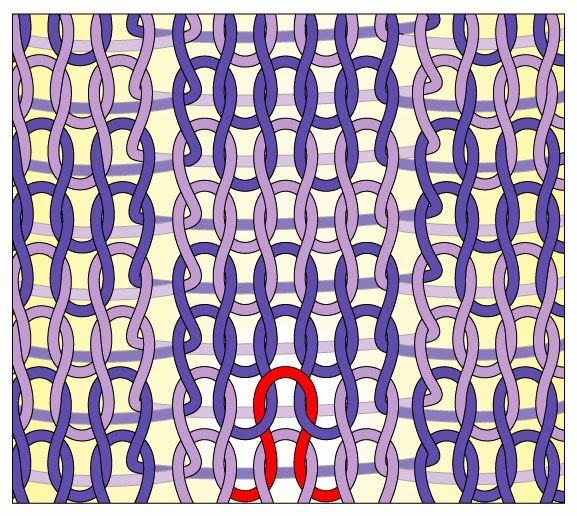 TECHknitting: A new trick for fixing errors in color knitting--"controlled drop"
A new trick for fixing errors in color knitting--"controlled drop"
Here's an "unvention" called "controlled drop" which can be used for correcting errors in color knitting. Suppose you're working stranded two-color knitting,* and notice a mistake somewhere several rows down. Theoretically, you could drop (run out) the column of stitches in which the mistake lies, fix the error, then latch the column back up. However, when you try this trick with color knitting, suddenly, there's a problem. The stitches you've dropped form a ladder, yes, but the strands of the other color running behind also form a ladder. Trying to re-latch the correct strands in the correct order is like playing cat's cradle. Today's post offers a way to drop columns in stranded knitting with confidence, easily keeping track of which strand goes where. I call this new trick "controlled drop." It is a variant on the ordinary drop-column method of fixing fabric. In fact, the two methods are so close, it makes to start with a review of column-dropping in ordinary knitted fabric. 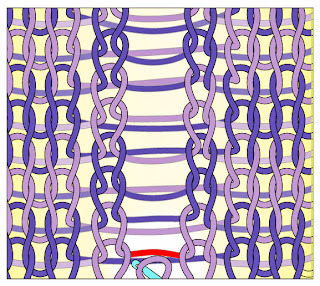 As the illustration shows, any one knitted stitch (red) lays along a column (dark purple). In fact, if you've ever had a ladder in a nylon stocking, you already know about columns in knitting. When one stitch comes undone, the stitches below it are released from their interlocked state, and return to being simple lengths of yarn, the "rungs" of the ladder, we might say. These rungs are shown in red below. You can fix errors made several rows earlier by purposely running out a ladder and fixing the error. You then re-latch the ladder, using a crochet hook, as shown. There's more stuff you can do with the drop column method** but this little review is all that's needed to set the stage for the color knitting trick. 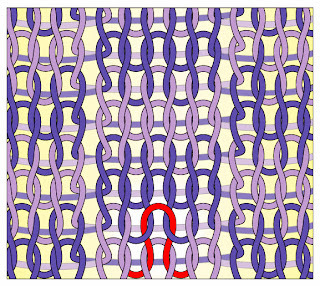 Below is an illustration of an error--a (red) inadvertent purl--in color knitting. As you see, if you were to freely drop a ladder, you'd have two sets of strands going. Which the heck strand should you pick up? 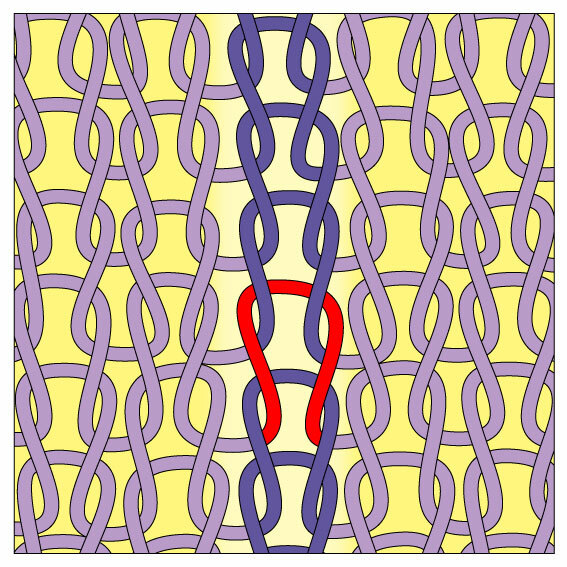 Sometimes the back strands are above the stitch strands, sometimes below. 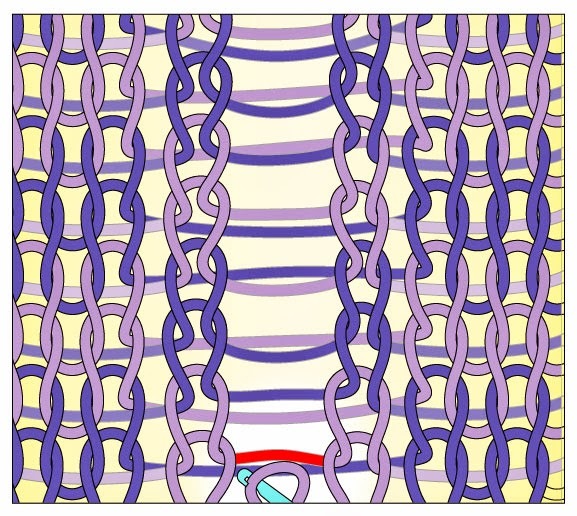 This illustration is bad enough, but in real life, the strands are far more bunched together, often behind one another, making them invisible unless you flip the fabric. So, what's the cure? The way I think about it, the confusion in picking up happens because, when you freely run out a column, what you're really losing is information. Before the drop, the column contained important information: the stitch-stack order--that is to say the color and position of each stitch in the column. Behind the column lay an ordered set of strands. 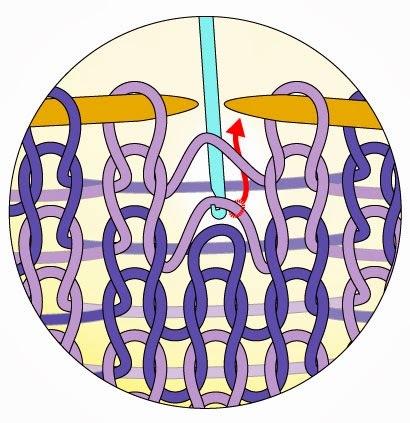 Once the stitches are freely dropped, not only is the stitch-order information lost, but so is info about the relationship between the stitch yarn and the strand yarn. Recapturing that information means you have to remember/look up the order of the original stitch-stack. However, simply knowing which stitch ought to come next isn't enough--you'll also need to grab the correct length of yarn from the tangle of released stitches and back strands. X-ray vision would also be handy, so you could see both fabric faces at once. In a nutshell, the problem is that you have to drop the column to fix the mistake, yet by so doing, you lose the information the column encodes. As is evident, what's needed is a way to drop the column, yet retain the information. That's where today's unvention comes in, a trick I called "controlled drop." A ladder in stockinette fabric is capable of being latched in either direction. So, what if, as soon as you released a stitch at the top of a column, you took a crochet hook in hand and instantly re-latched it into a new, upside-down column? With this trick, each stitch is loosened only for the amount of time it takes to unpick it from the original column. It's then instantly latched up again, this time going the other way. Also, with this trick, the strands are never involved, so they can lay quietly undisturbed on the fabric back. Instantly re-latching lets you drop, yet saves the information. 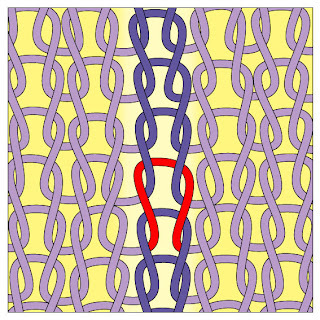 Stated otherwise, when re-latched upside-down, the stitches are reversed, yet each stitch's order (relationship to other stitches) remains undisturbed, as does the relationship of the stitch to the back strands. The process is called "controlled drop" because the dropping process is controlled: the column is let out stitch-by-stitch, rather than a freely dropped column of the kind you would use in plain (non-color) knitting. Start at the top. Once two stitches have been released, insert the crochet hook under the second "ladder rung" and draw the second rung though the first. This maneuver creates the foundation for the upside-down re-latch column you'll be making. Continue in this manner, drawing each stitch released from the original column into the new upside-down column. As you can see, it's possible to unlatch and re-latch in a single motion. 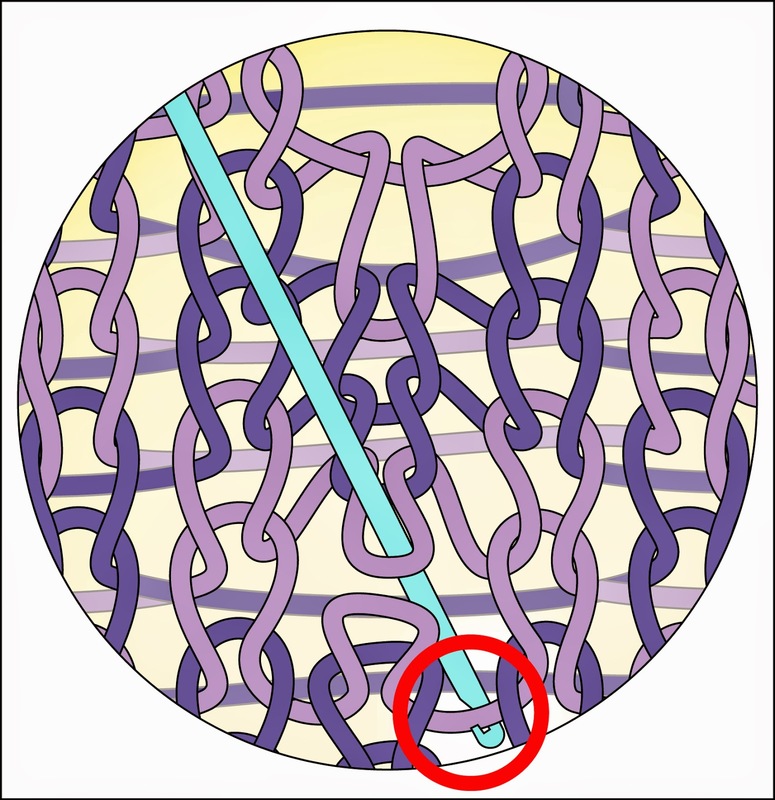 The red circle shows how this is done--the crochet hook unlatches the stitch from the original column by grabbing it where it arises out of the fabric (the side of the stitch). When this part of the stitch is yanked, the stitch-loop pops free, turning into a single strand of yarn (a "ladder rung") which can be instantly re-latched into the new upside-down column of the controlled drop. Using this method, you keep un-and-re-latching until you get to where the problem stitch lies, and can fix the error. With the problem solved, you reverse the process. In other words, insert the crochet hook into the loop of the newly-corrected stitch--the hook will now be be the bottom stitch in the original, right-side up column. You then loosen and re-latch the upside-down stitches, one by one, from their portion of the column. 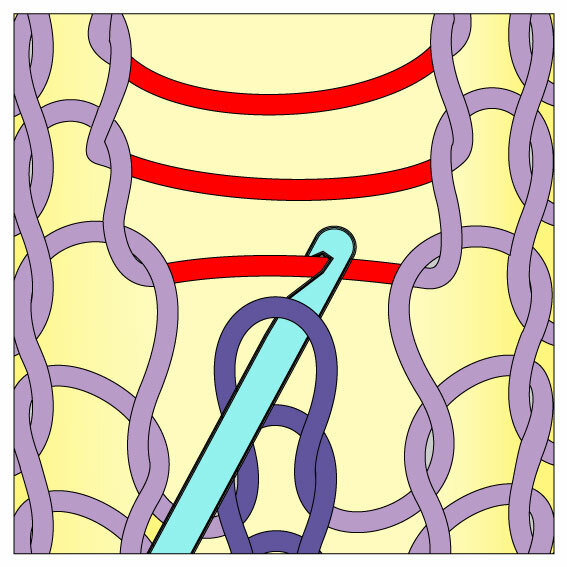 This restores the original direction of all the stitches in the column. At the top, the last loop is returned to the knitting needles. Once your column is safely corrected with the top loop secured, stretch the fabric around the fixed column several times. The fabric will settle down to look exactly like it did before you released the column: the stitches will be in the correct order, the strands remain undisturbed. The only difference is, the error is gone, fixed by you at the interface between the controlled drop and the original column. PS: The whole idea of knitting encoding information is not original with me. The best-known example of encoding comes from the Tricoteuses of the French Revolution, among whom the fictional Madame Defarge was the most famous. True, these knitters were encoding a different kind of information (spoken words in a sort of a morse code vs. the order inherent in the fabric itself) but the concept is similar: stitch order encoding information. PPS: Controlled drop is not only for color knitting: it can also save your neck in the case of having to drop a single column nearby to complicated shaping. See, a giant ladder in a lace garment is a headache, especially if YO's are involved, but if you're only dropping a single column to correct a mistake, you have a better chance of setting order out of chaos if you use controlled drop. You've been reading TECHknitting blog on: "A new trick for fixing mistakes in color knitting--'controlled drop'"